It can't be stressed enough just how important it is to take care of your feet. 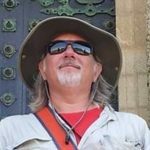 On my first Camino I shredded me feet. I'd read about foot care, and felt like I was prepared, but I live in the desert (i.e., no humidity) and I walked a lot of miles in preparation of my pilgrimage; unfortunately, nothing prepared me for the humidity. What I learned: dry, friction-less feet are the goal. Sock liners are a very good thing. Sock liners absorb the extra moisture from sweat and humidity, which helps keep your feet dry. If you stop for a break to rest, take off your boots. Fresh air help cool and dry your socks and feet. When you stop for lunch, take off and even change your socks. It makes a world of difference to air out the dogs. Notice some rubbing or friction? Place sports tape over the area. If you reduce the friction you reduce the chance of getting a blister. Got a blister? Place sports tape over it and leave the tape on until it falls off on its own. I had horrible blisters the first few days of walking and those burst and got gross. I tried several remedies and none worked. A bike rider told me about sports tape. I took his advice and my feet healed while I walked. 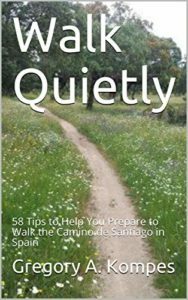 You'll be spending many hours on your feet each day as you walk and navigate the paths of your Camino de Santiago. So, choosing great socks is important. They provide support and cushion for your feet and, depending on how long you're going to walk, they need to hold up to daily hand washing and line drying. Most packing lists include packing two pair of socks, but they don't usually tell you what kind of socks to pack. There are lots of choices, of course, but my favorite, by far, are Smartwool Socks. The heavier, hiking crew socks. They've got a reinforced heel and toe, and they held up to 7 weeks of hiking. Actually, I'm still using them. In addition to the hiking socks, you might also want to consider sock liners. They add a layer of moisture wicking protection (very important in the humidity of Spain). Also, if you damage your feet and end up with blisters or sores, the liners will add a soft layer of comfort, too. While the more expensive Smartwool liners are nice, after damaging my feet (which was gross) I found that buying ankle footie socks at the small shops (usually 3-6 pair for a few Euros), I could wear them once and discard them.